Back in January I wrote about 3 brand benefits of Klout. Today, Klout launched brand squads, which is their version of brand pages into beta with Red bull as their primary launch partner with more to come in upcoming weeks. Red Bull was also a key innovator with the launch of Facebook timeline for brands as I recently covered as well. 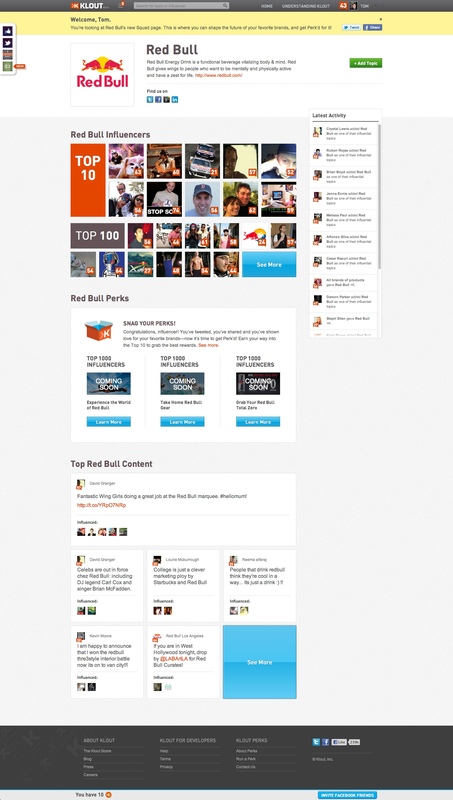 With the new release, Garth’s words ring true in that the new squad pages uncover the top influencers associated with the brand (topic) as well as showcasing the latest Red Bull content and providing a platform for the brand to directly reward influencers with brand centric perks. This presents an interesting dynamic for brands, as they are able to reward those individuals that are already passionate about the brand vs. pushing content to individuals to consume. By aligning influencers directly with the brand, it provides an easy point of connection between brand & influencer. 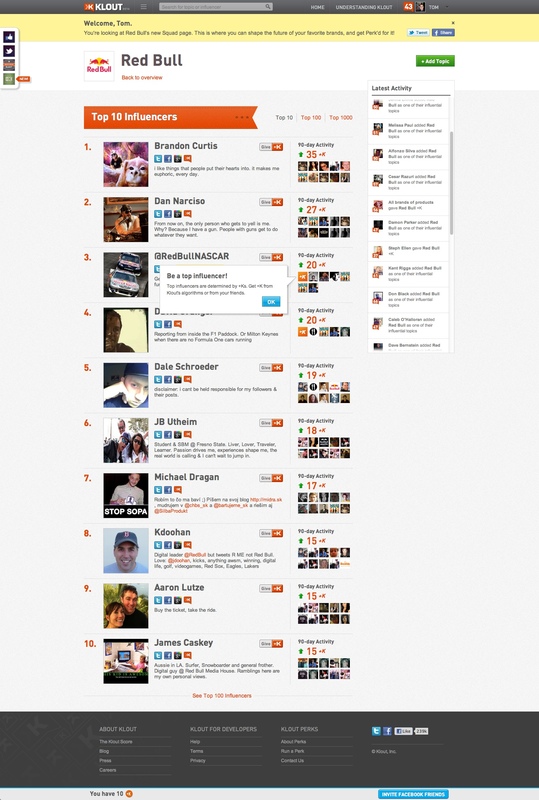 The top influencers are determined by +K’s which are given to other users who are influential around specific topics. Note that +K’s are specific to the Klout platform meaning, users who are already engaged with Klout directly are influencing the allocation of +K’s vs. simply using a users Klout score. This is a key point to consider for brands looking to solely use Klout squads as a primary influencer identification & engagement channel. Top influencers also have an opportunity to receive a news associated with the brand as well as access to brand perks that are centralized within the topical brand page vs. the normal perks location via the navigation. Normally, perks are exclusive products or experiences that users can earn based on their overall influence tied to their Klout score that are distributed to select influencers based on their topics of authority, location & score. With the introduction of squads, a secondary level of perk associated with topic specific influencers are also available. I have a request in to Klout to confirm if the topical perks are also associated with a premium cost similar to the existing perks program. This is a significant step forward for Klout as it creates a more relevant experience for brands vs. treating brands as an individual and applying the Klout algorithm solely based on the brands published content. 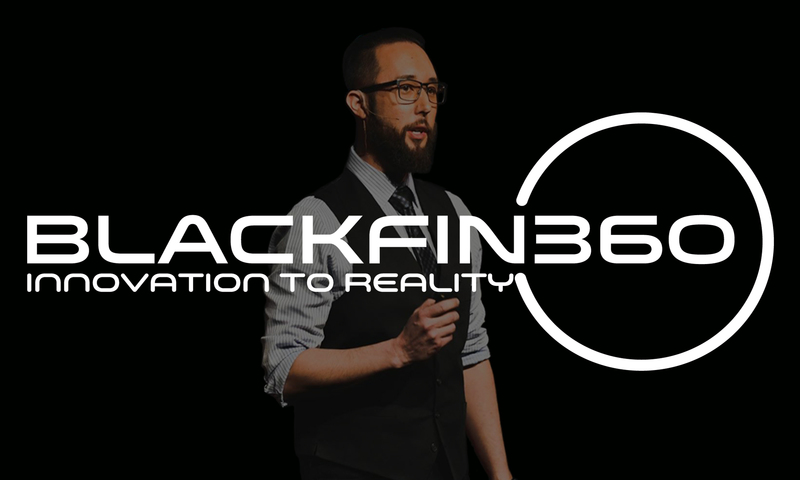 This new model makes more sense from a brand perspective. It will be interesting to see how the topically driven influencers begin to align as the system is predicated on klout’s proprietary +K’s. Identifying topical influencers has been a key to driving awareness and activation for many socially progressive brands over the past few years. One of the measurement variables many brands have come to rely on is Klout. Much has been written about Klout since it’s founding in 2008. Some praise & swear by the service, others question the validity of the score and ability to “game” the system. Regardless, users work each day to increase their Klout score and brands are eager to reward those indiviuduals. At it’s core, Klout provides social media analytics to measure a user’s influence across their social networks such as Facebook, Twitter, Google+, Linkedin, Foursquare, and many more and assigns a score to the user. This daily score is meant to reflect the influence that individual has to drive action in social networks. Currently, Klout boasts over 100 million profiles, 2.7 billion+ pieces of content & connections analyzed daily and 5,000+ partners & developers with over 45 billion+ API calls. From a brand perspective, there are multiple ways to leverage this data and audience to drive action. 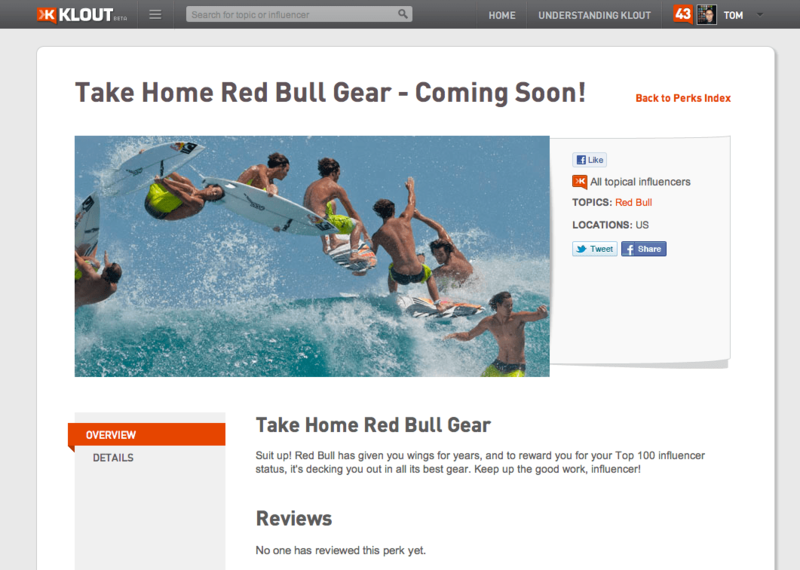 From the Klout Perks program, to leveraging Klout’s API to the upcoming Klout brand pages. Klout Perks – The most visible brand programs associated with Klout is tied to Klout perks. Perks are exclusive products or experiences that users can earn based on their influence. Perks are distributed to select influencers based on their topics of authority, location & score. 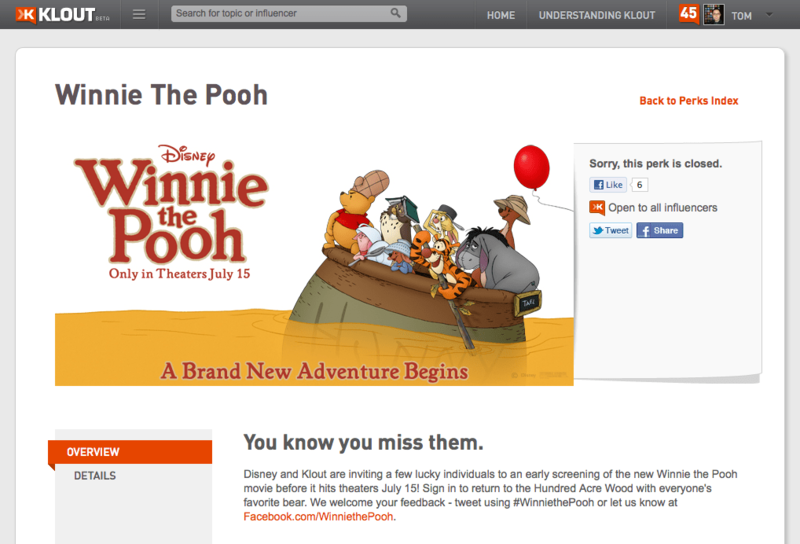 This summer, I was associated with a perk from Disney to attend a pre-screening of Winnie the Pooh. Being a dad of 3 young children it served as a great opportunity to provide a unique experience for our entire family. Influencers who receive Perks can choose to talk about the perk/product or not but the thought here is that by enabling the product or experience, the influencer will feel compelled to share the perk with their network as I did with the Winnie the Pooh perk. Hyundai: Integrating their Social & Gaming activation with VIP tickets to their Veloster Gaming event. Perk programs are categorized by Entertainment, Experiences, Food & Beverages, Retail, Sports & Technology. For a brand, Perk programs can enable new product launches, sampling programs, experiential entertainment and more. Affordably priced, brand perk programs are the most direct way to activate against the 100+ million Klout profiles. Klout API – With over 5,000+ partners and developers, Klout’s API is leveraged by brands for multiple purposes. With Klout’s API, you can glean data such as Klout Score, which is the most used API, or specific sets of data tied to topics such as “Marketing” or “Facebook” and unveil up to 5 topics tied to users. There are some requirements to fully maximize the API, such as in order to request a Klout score for someone through the API, you have to have their Twitter ID. This is key for brands developing their Social CRM programs. A brand may want to map existing data into Klout’s API and the brand should account for capturing Twitter handles as part of their social data mining strategy. Some brands are using Klout’s API data in innovative ways, One example is CapitalOne. 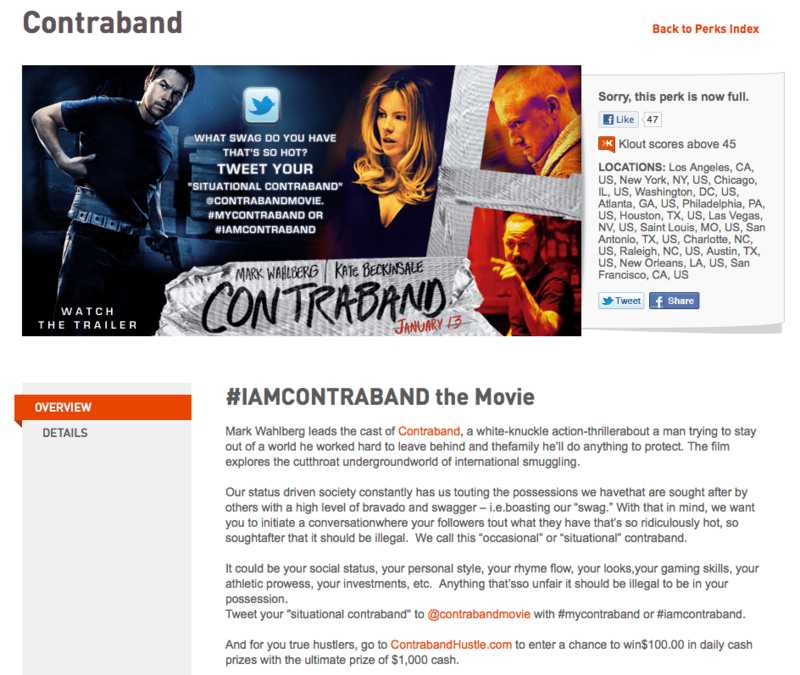 They leveraged the Klout API to accelerate users in their loyalty program. 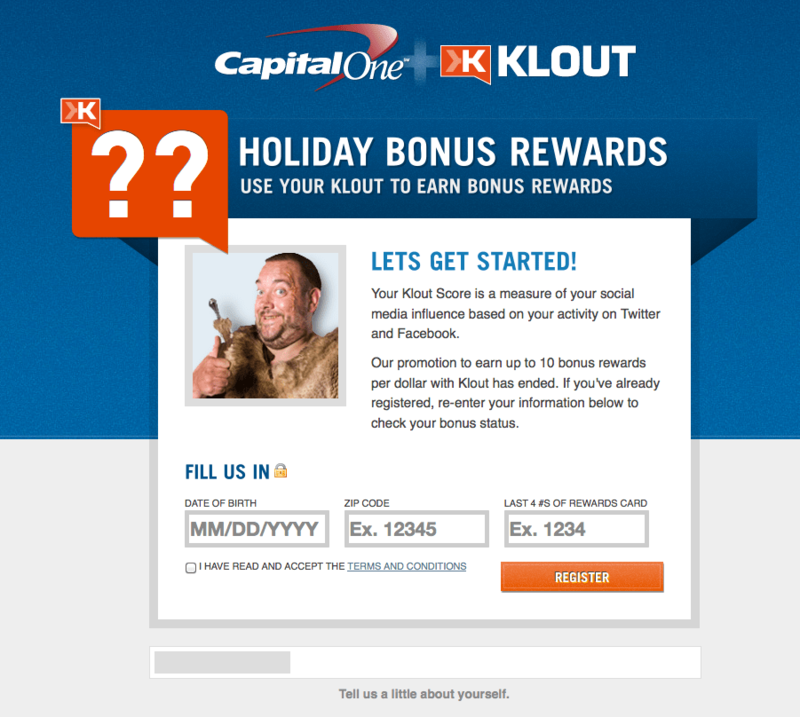 They offered bonus rewards to users based on their Klout scores. This means everyone who participates with a Klout score between 10-100 gets some form of bonus rewards based on their influence. The API presents unique and compelling data that brands can leverage to drive engagement & target key topical influencers to drive action or reward and accelerate via loyalty programs. With Klout Brand Pages, brands will have an opportunity to build influencers groups that are related to their specific industry. An example for a brand such as American Airlines would be able to associate with specific topics such as travel and interact directly with those influencers. Brands will be able to show their content & streams and also show the most influential content about American Airlines. Elements such as Facebook comment engagement, Retweets, etc.. will aggregate into Klout brand pages and the brand will have an aggregation point of influencers to drive direct communication. Premium levels will be available for brands to subscribe to for additional outreach capabilities. I will follow up with a deeper dive into Klout brand pages once the service launches in February. Thanks goes to Garth Holsinger of Klout as well as Brad Alesi of The Marketing Arm for data points included in this post.